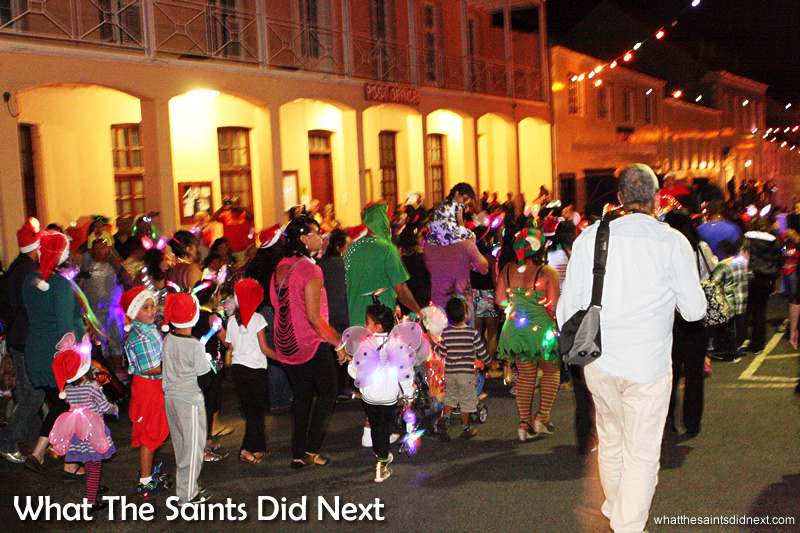 Three nights before Christmas, the streets of Jamestown exploded in a dazzling feast of colour and light as the St Helena Festival of Lights 2014 parade organised by Pilling Primary School, gaily ‘danced down the street’ spreading cheer to hundreds of onlookers lining the pavements. It was a sight to behold, enhanced by the darkness of night. A river like procession sparkling through the town. 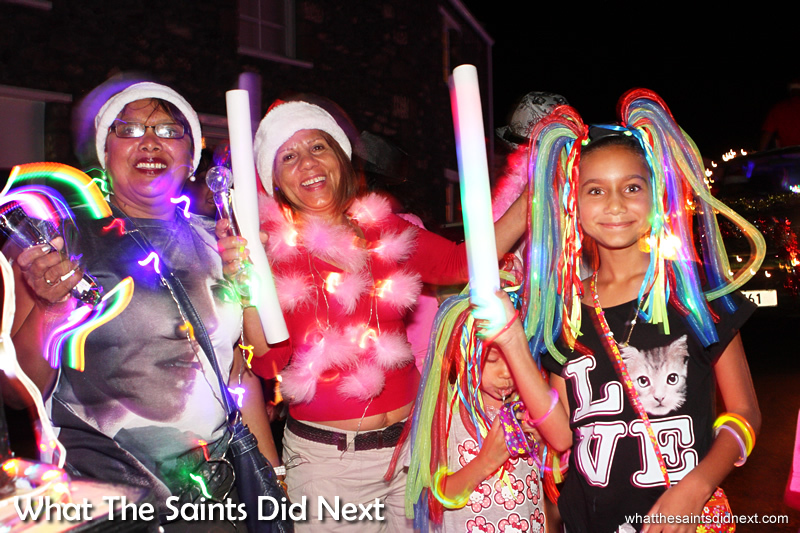 Hordes of revellers of all ages draped in battery operated fairy lights accessorised with spinning, flashing and sparkling LED gadgets. 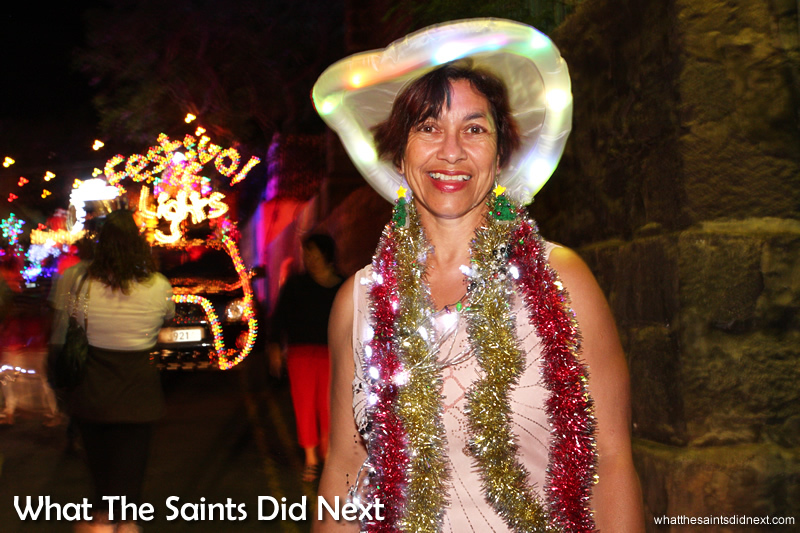 Leading the way was the ‘Festival of Lights’ float fashioned from rope lighting, closely followed by a gaggle of gleeful, primary school cheerleaders, showing off their well rehearsed routines. 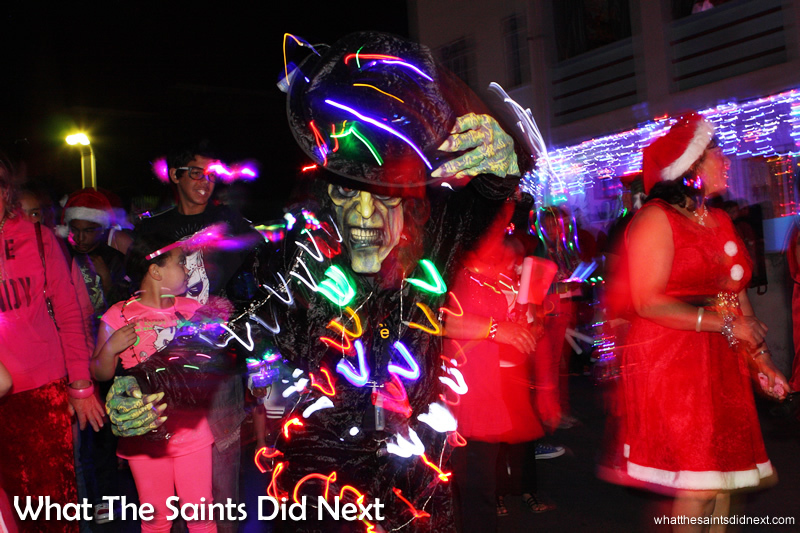 There were plenty of creative costumes; a luminous Star of Bethlehem, umpteen Santas, fairies, elves and angels, a human sized present, a Transformer, Frozen’s Princess Elsa – even a scary ghoul, an obvious Halloween leftover. Sales of novelty lights must have gone through the roof for local shops. 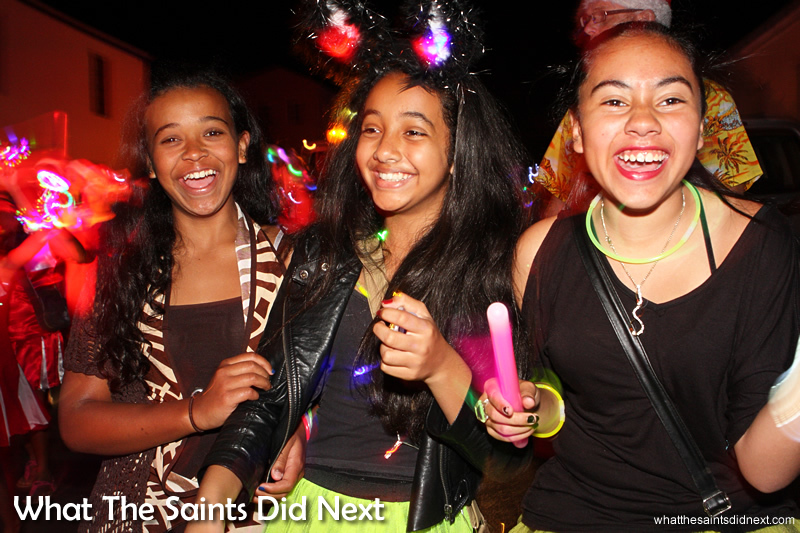 Glow sticks, necklaces, bracelets, rings, hair bands, swords – anything that glowed was used. 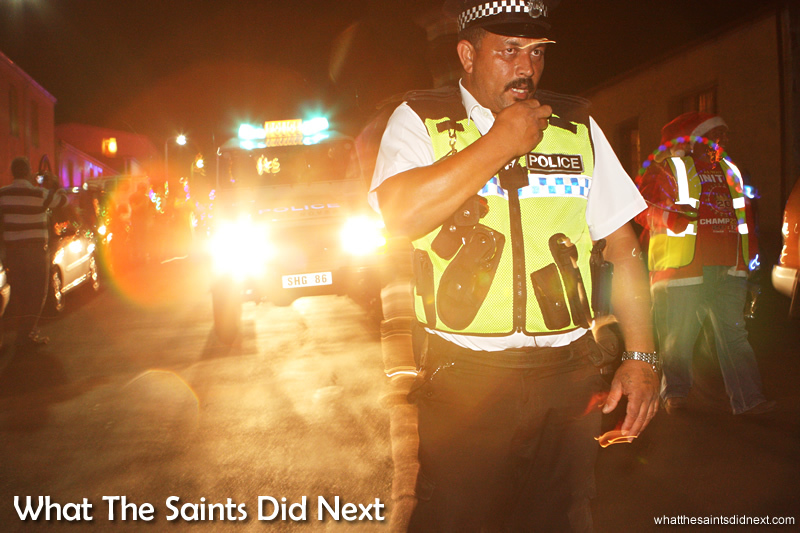 We weaved amongst the spectacle, cameras in hand to capture the fun. 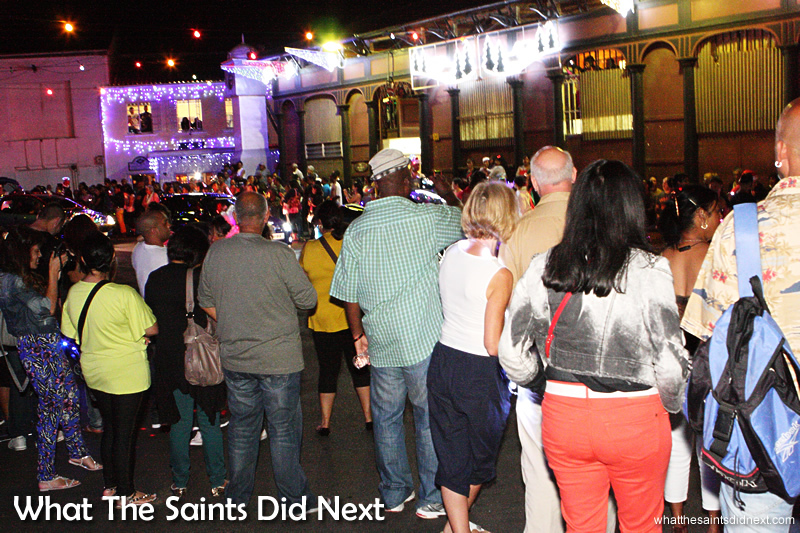 The atmosphere was infectious and electric – literally. 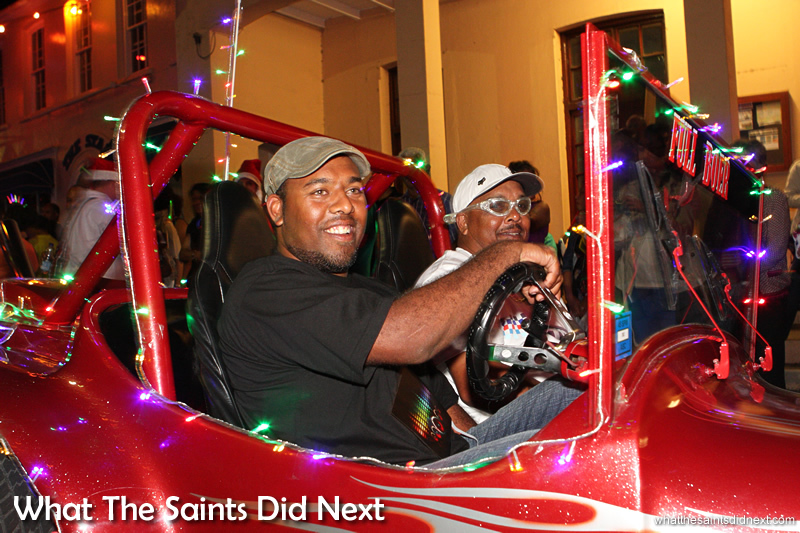 Floats, cars, trucks and beach buggies, absolutely dripping with decorations and lights running off portable generators, as they pumped out heart-thumping Christmas music to create the party vibe. 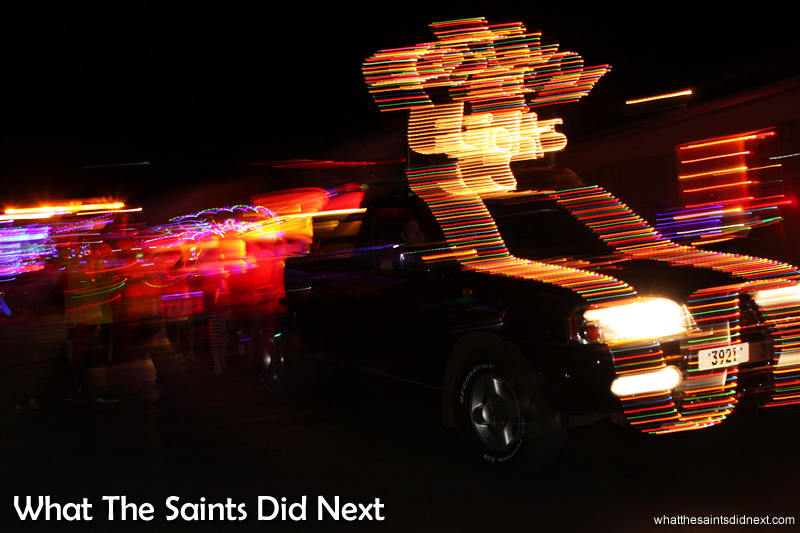 The main mile long street of Jamestown was packed out and it was fascinating to see so many people come together for the celebration. 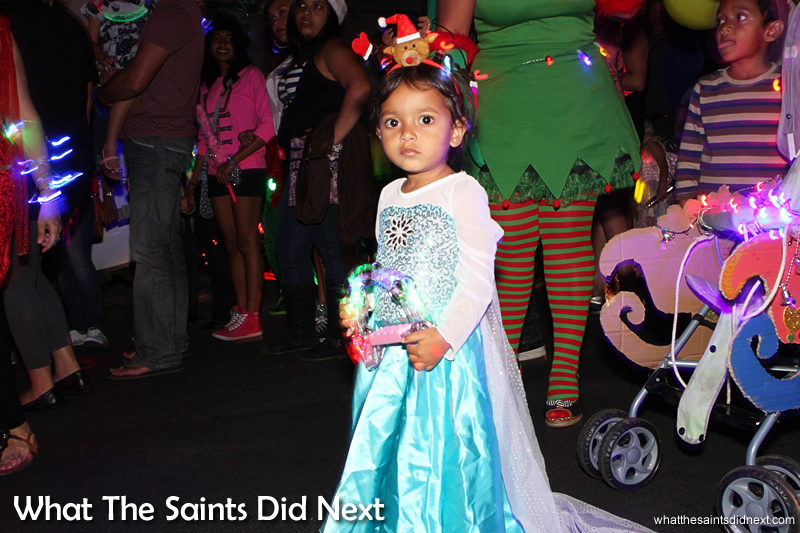 Young faces looked on in awe at passing reindeer, sleighs and Christmas trees. There was plenty of waving to Santa. A small collection of motorised toy cars and quad bikes were being quite expertly driven by little people. A scary ghoul hung around after Halloween to be come a Christmas ghoul! 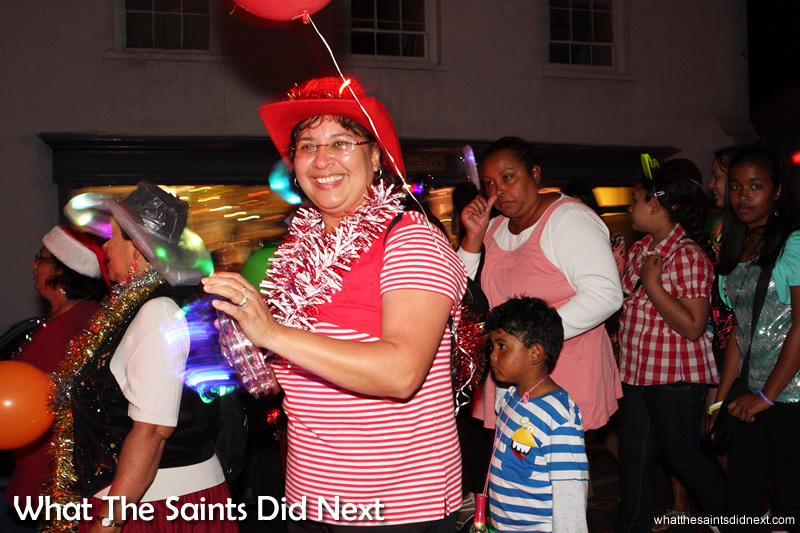 Pilling Primary School’s headteacher, Elaine Benjamin, organised the event once again. 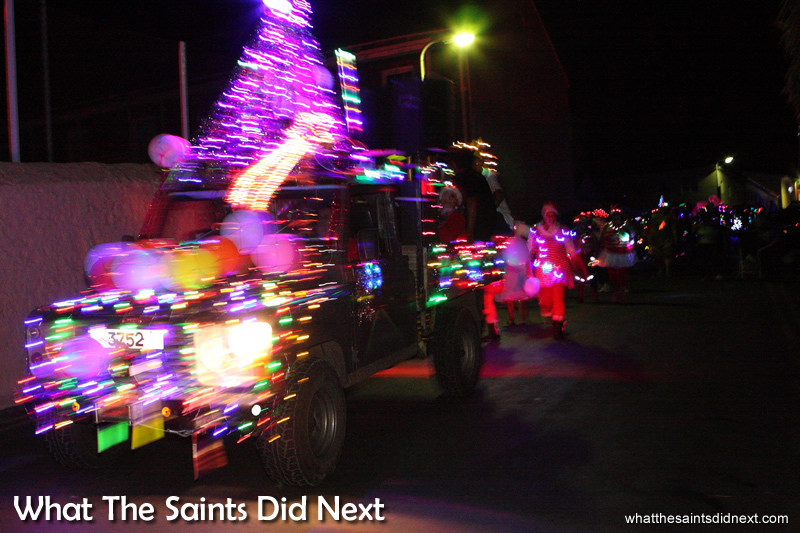 Even the police joined in the spirit of the night, flashing the red and blue lights on their Land Rover as they escorted the procession. 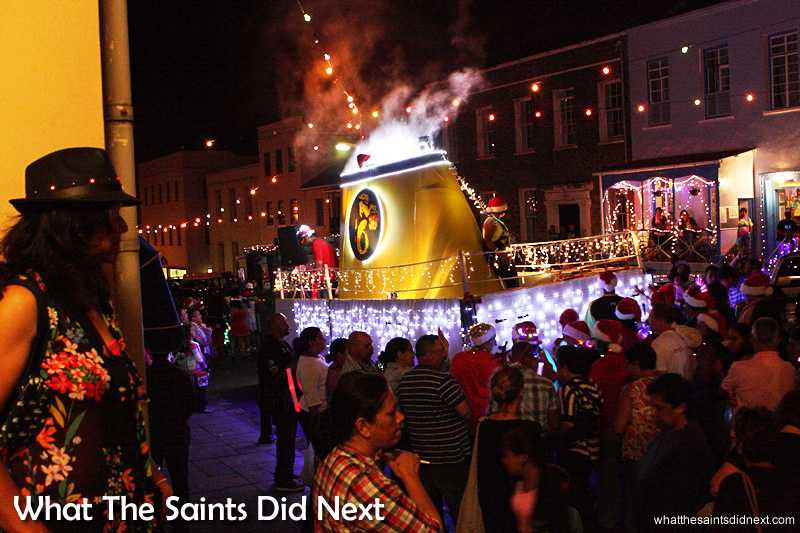 Bringing up the rear was an excellent nautical float, built on top of a lorry; the yellow funnel of the island’s supply ship, RMS St Helena, emblazoned with the sea serpent crest and complete with smoke effects. Earlier in 2014, the vessel itself celebrated 25 years of service to the island. Everyone was in a good mood, laughing, dancing, catching up with old friends and posing for selfies. 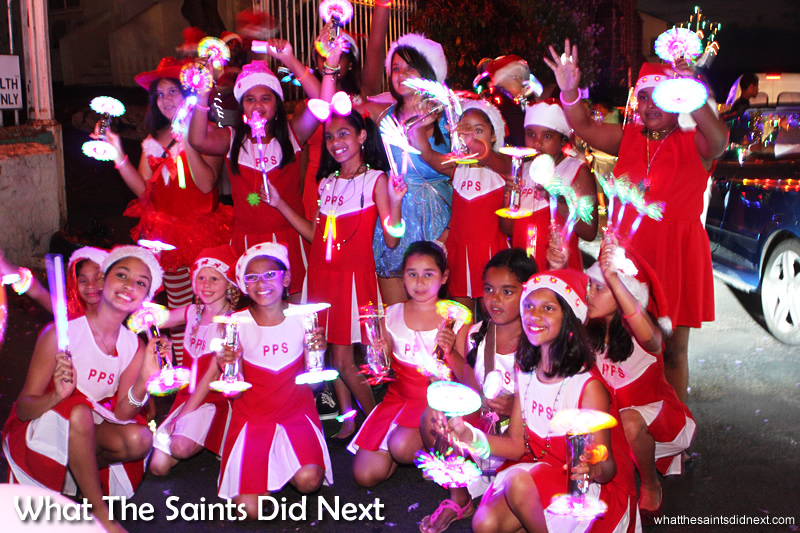 The event is new, organised by Pilling Primary PTA each year. 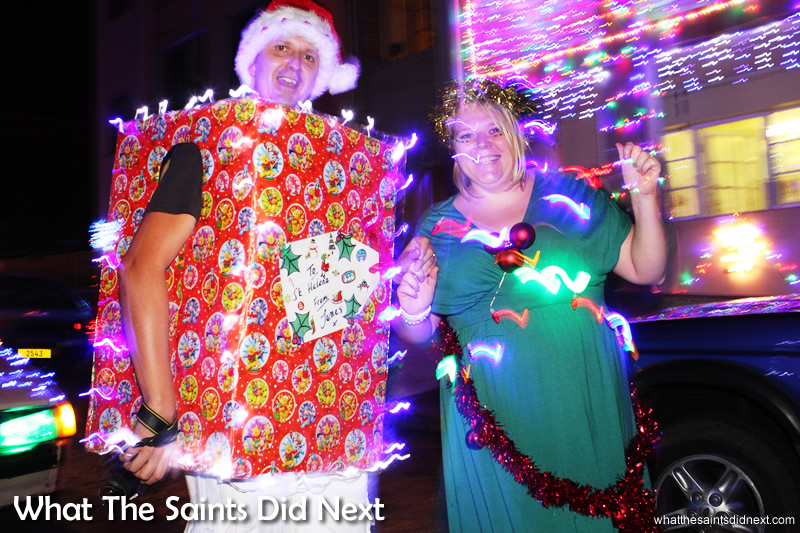 Embedded within the parade, smiling, costumed members of the PTA jangled collection tins, which prompted quick grabs for wallets. The procession came to a stop in the Grand Parade square and we were treated to a finale of singing, cheerleader routines and hip hop dancing on the Court House steps. 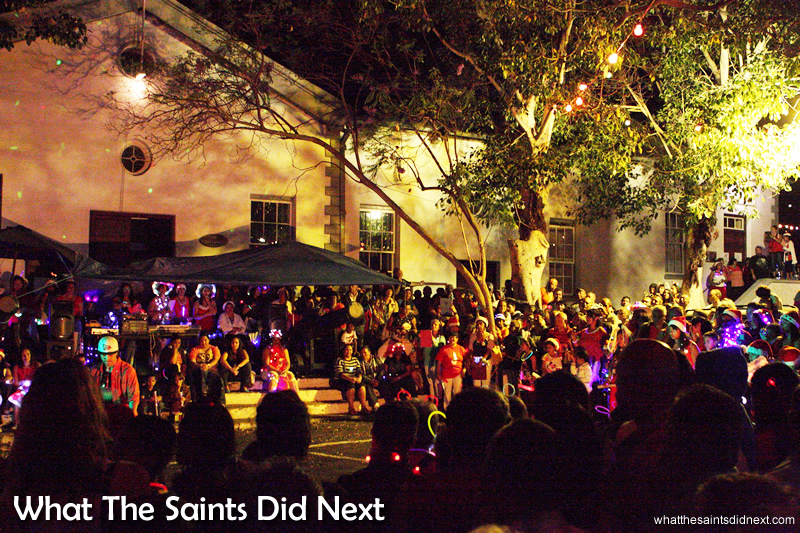 This was the best turnout to date for the Festival of Lights. 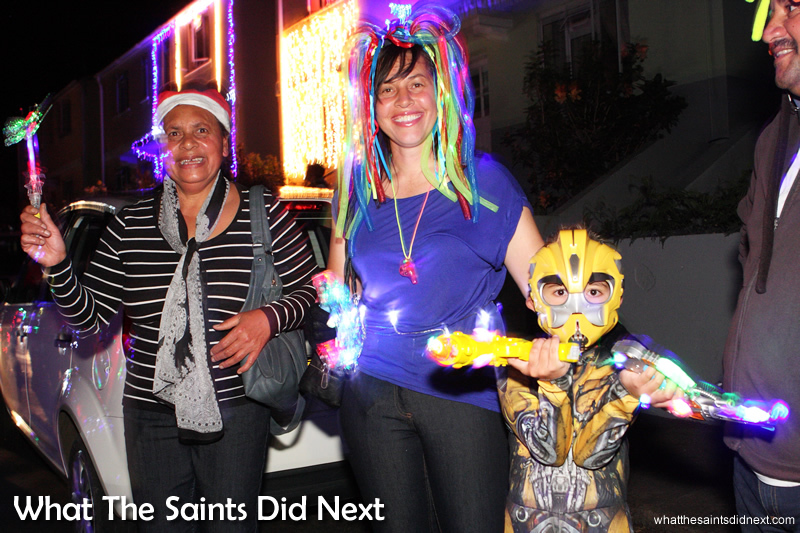 After just three years since it began, this has now probably become the most eagerly anticipated fixture on the St Helena Christmas calendar. This extravaganza should thaw the heart of any Scrooge; if this doesn’t get you in the mood for Christmas – nothing will.